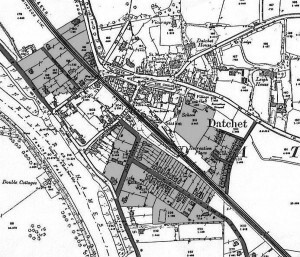 The first part of the Growth of Datchet described the early development of the village, which then hardly grew at all beyond its medieval centre throughout the 1700s and early 1800s. During that period very few houses were constructed on new sites, but many of the old houses were rebuilt and others were updated by the addition of fashionable Georgian brick fronts. 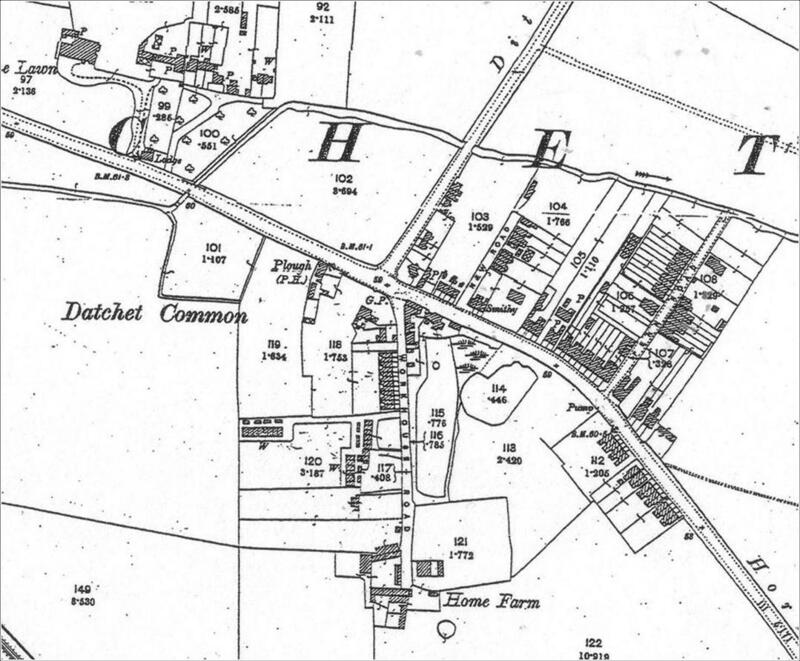 During Queen Victoria’s reign (1837 – 1901) the population of Datchet doubled; at the 1841 census it was 922 and by 1901 had grown to 1,834. (In 2011 it was 4,913.) Two main factors account for such rapid growth: the arrival of the railway by which people could commute to work in London, and the agricultural depression which for the first time made it profitable to sell farmland for housing developments. A few years later the Duke of Buccleuch, Lord of Datchet Manor, sold land between Slough Road and the new Windsor Road (already sliced through by the railway line) for housing development. This plot had previously been called Pound Close, a field where straying cattle would be impounded under authority of the lord of the manor. It was highly significant that both the Goodwin and the manorial lands were released on to the Victorian developers’ market just as Datchet was becoming attractive as a riverside commuter village and resort, so that a great building boom ensued. When the Goodwin land was sold it included the site of a very old farmstead in the High Street, opposite their Goodwyn House. Its sale and demolition provided the space for this first new road to branch off the High Street and access the extensive fields beyond. Three pairs of houses at the top of the Avenue (plain-looking but with quite grand interiors) date from the late 1870s. At the other end of the road, set diagonally to take advantage of river views, is The Maisonette of 1886, and on the opposite corner, also set diagonally, is the picturesque red brick and mock-timbered Swancourt. This has always been one of the most sought-after roads in the village, its moderately-sized ‘villas’, as popular in the 1880s as they are now. Plots of land were bought by speculative builders, many of them local, and designed in a variety of sizes and styles, typically of red and yellow brick with decorative patterning or mock-timbered details. A very few houses are on larger sites and decorated with more lavish and interesting detail. The name ‘Montagu’ alludes to the Lord of the Manor and although there was no real link with the family it may have been so named in 1885 when Henry John Montagu was created Lord Montagu of Beaulieu after his father’s death. Development along the new Windsor Road and Buccleuch Road, opened in 1888, became possible due to the sale of the manorial Pound Close, but few houses were built until well into the twentieth century, probably due to risk of flooding. Inniscrone House, in typical brick and mock-timber style on the corner of Buccleuch and Queens Road, was built before the end of the century, while the extravagant Datchet Court on Windsor Road dates from about 1900. Before 1850 this road only led to Southlea Farm but as part of the railway development it was extended to Old Windsor via the new Albert Bridge across the Thames. One of the earliest Victorian houses in the village is Whitelodge, built early in the 1850s in an Italianate style which is very unusual for Datchet. Little further development took place until Sir William Shipley built the enormous and rather intimidating Riverbank in the 1880s. No building took place beside this old road until the need for development land overcame the fear of floods. Until the late 1800s it had been described as a ‘watery lane’, with willows planted as guide-posts along its edges. Although the 1860s Churchmead House was in Slough Road, it was built well away from the road itself. There were fewer houses built here in the 1880s than in other new locations and the plots were larger, so that a lot of infilling took place in the twentieth century. White’s Lane, leading north from Slough Road and consisting of a few small houses, is actually an ancient access lane once running through the fields to Riding Court. It is now cut off by the M4 but the old track still exists on the other side of the motorway. The road to Eton was an old route but no houses had been built along here before the 1880s. In some ways it is a mirror image of Montagu Road, although the plots are generally bigger and many of the houses are grander variations on the same theme of brick and decorative timbering. Its direct access to Eton probably made it an even more prestigious location than other new developments in Datchet. The area bounded by London Road and Horton Road remained undeveloped until the twentieth century. This was mainly due to the presence of two very old estates, Leigh House (to the west) and The Lawn (further east). Both of these owned extensive grounds between the two main roads, plus subsidiary houses, cottages, lodges and outbuildings, all reached from one main road or the other. These estates remained intact well into the twentieth century. Also, much of the agricultural land bounded by these two roads and by Ditton Road was farmed by the very successful John Kinross of Riding Court and was not yet to be sold for development. After the Goodwin land sale, this old lane was developed on its western side with new terraces of small houses named Wilton Cottages, the only such row close to the village. They were rebuilt in the 1970s but some similar old cottages survive in Datchet Place off Green Lane. Several of the houses here also functioned also as small shops. All this fashionable development depended on a great many local people engaged in the building trades and in the provision of services — and servants. Housing for these families was also built rapidly during this period, often by local builders for themselves and to rent, as they profited from Datchet’s building boom. In families for whom the only work available in the past had been agricultural labouring, life must have changed dramatically. This far eastern end of Datchet became a separate and thriving community by 1900, distinguished from the village by its name, Datchet Common, and including parts of Horton Road, Ditton Road, New Road, Penn Road and Workhouse Road (now Holmlea Road). Groups of tiny cottages for farm workers had existed here before, but by the 1880s they had been supplanted by many more well-built terraced and semi-detached houses, often with decorative brick detail. New Road seems to have been developed before Penn Road, although there were more houses in Penn Road by 1900. The area was well provided with its own shops, a post office, mission chapel, three pubs and a blacksmith.